The car ahead of us sideswiped a sea gull. Stunned, the big gray and white bird with the long curved beak spiraled to the side of busy Lem Turner road. It fluttered and squawked at the evening rush hour traffic speeding past, rushing into downtown Jacksonville. "Look, Daddy, it's hurt," cried Eve, my pre-teen daughter, from the rear seat. "Stop. Let's help it," she said, her voice sounding anguished with deep Christian compassion. What do I know about doctoring sea gulls? I ignored her and kept driving. Donald, my teenaged son, beside me in the front seat, had been memorizing Bible verses at Sunday School; he quoted Scripture at me. "The righteous man regardeth the life of his beast," he said. That's from Proverbs or Exodus, I think. "God knows every sparrow that falls -- that means sea gulls too doesn't it, Dad," one of the kids said. How come my kids only remember the Bible verses that inconvenience me? Patricia, my youngest daughter, slept sprawled across her side of the back seat. I'd taken the kids out to the Jacksonville Zoo all day and I was hot and tired. I wanted to get home and take a nap too. I'd had just about all the family togetherness I could stand for one day. But as I passed by on the other side of the injured bird in the road, I dimly recalled some preacher or the other from the past saying, "God has no hands but your hands to help those in need." Sure. Is the Creator of the Universe helpless? If He wanted me to help that bird, He'd have made me a veterinarian, wouldn't He? All sorts of excuses blossomed in my mind. But no vet was on the spot, we were. Ok. Ok. I understand, I thought. No hands but mine. God can't get along without my help. Besides, what example am I setting for the kids? I circled the block and cruised back to where the wounded sea gull flapped beside the road snapping at passing cars. How do you catch an angry sea gull? 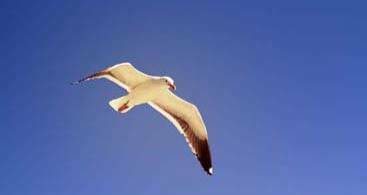 Can sea gulls bite people? Eve crept in from its right side. Donald crept in from the left. I stood in front of the bird to block its escape. One...Two...Three -- the Cowarts lunged. The sea gull also lunged. Somebody -- I won't say who -- flinched. Hey, it was a big bird rushing right at me. Naturally, the gull got away. Terrified, the huge white bird ran flapping out into six lanes of rush hour traffic. A blue Toyota van ran right over the top of it! Miraculously the bird appeared to be hurt no worse than it was at first. It scurried to the far side of the highway. The unrelenting Cowarts, intent on helping, dodged traffic and reached the other side of the road too. We were on a mission from God. We herded the bird into a corner of a chain link fence, grabbed it and carried it back to our car. Success! Wouldn't God be just tickled pink over the hand we were giving Him in helping His poor wounded creature? Maybe so. But sea gulls are ungrateful birds. This one expressed his (or her) opinion of our help by snapping at us with that wicked beak, squawking loudly, and by doing that other thing sea gulls do best. Fortunately we were foresighted enough to wrap the bird in a plastic grocery bag so the car didn't get messed up. Now that the gull was safe, we decided to free it down near the Ribault River Bridge. But ... after we had already let it go, we reconsidered. Maybe the bird might be better off in our own back yard for a day or two. So we caught the bird again and put it back into the grocery bag. This did not make the sea gull happy. See, we have these three cats. Ha! Stupid cats. All three of them stalked the huge sea gull round and round our backyard. The orange kitten bravely pounced on its back and the sea gull whacked it with a wing to send it reeling. The other cats licked their lips and crouched waiting their chance to attack. We had to save it from those vile cats, didn't we? God has no hands but our's to help, so once again the Cowart family herded the sea gull to a corner of a fence. The bird poked its head through the wire -- and got stuck. Before we could free it, Sheba, our black lab, charged out of the house and immediately decided this flapping intruder was the bugler we keep her to guard us against. She galloped up to the sea gull, grabbed it in her mouth and ran as the cats loped after their stolen prey. My youngest daughter snagged Sheba's tail and tugged the dog to a screeching halt. She pried Sheba's mouth open and freed the bird. But God's sea gull did not feel welcome in the Cowart household. Perhaps we should take it back to the river and let God take care of it Himself. About that time, Skunk, a toothless old stray dog that has roamed our neighborhood for years, saw us at the dock. The friendly stray noticed that we were doing something interesting with a grocery bag. Food? He ran over. He saw the sea gull. He pounced on it and began gumming feathers with wag tail joy. Donald quickly shooed Skunk away and nudged the sea gull out into the water. It paddled rapidly away to join a raft of other sea gulls floating on the Ribault River. Apparently nothing had been injured more than the bird's dignity. God must really care for sea gulls. We had seen this poor terrified bird run over by a Toyota, captured by giant humans, stuffed into a plastic bag, stalked by cats, tangled in a fence, mouthed by a black lab, driven all over creation and pounced on by a stray -- all in the name of the Cowart’s "helping" God, serving Him, trying to be His hands on earth. Odd, isn't it? God does indeed protect His creatures. But often it seems that He has to protect them from the hands of those intent on helping Him. But doesn't God need our help? After all, we are the children of God, aren't we? Yes, we are. But I suspect that the term "children of God" might well be translated ""The Four-Year-Olds of God". Ever have a four-year-old "help" you paint a wall, bake a cake, or wash the car? You let your children give you a hand at things in order to help them grow, not because you need their hands to get the job done. I suspect that God gives us the privilege of serving Him not for what it does for Him, or even for what our bungling efforts may do to help others, but for what helping does for us. God is not feeble and helpless. Certainly He can manage to get along without us. The Lord God Omnipotent Reigneth! Yet, sometimes He does allow you and me the privilege of helping, of serving, of acting as His agents, of being His hands. What a signal honor we have! What a considerate God we worship!